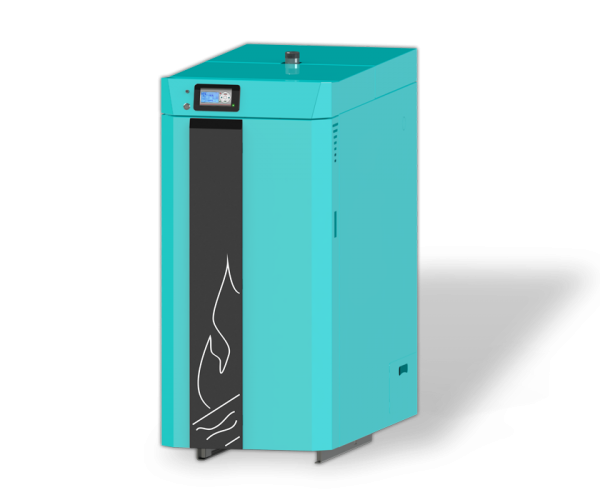 BioTec-C steel hot water boilers (with nominal heat output of 25 to 45 kW) are designed for wood log fuel firing for the heating of small and middle sized premises. The wood gasification principle enables a complete fuel burning. 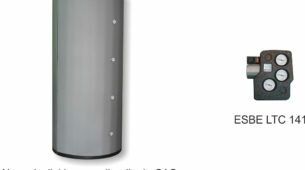 Logs up to 550 mm long can be inserted into the large combustion chamber. The burning period for a single fill of logs is at least 4 hours at the rated output and can be extended to a whole day if the need for heating is less. The boiler can keep the glow even 8 hours, which means that in this period it is not necessary to fire up the boiler in order to keep the heating process. Boiler operation is managed with inbuilt boiler control unit using the boiler temperature sensor and changing the rpm’s of underpressure fan on flue gases outlet from boiler. Boiler is connected to the central heating system through a 3-way thermostat valve accumulation (buffer) tank (like CAS, CAS B, CAS S, CAS BS). 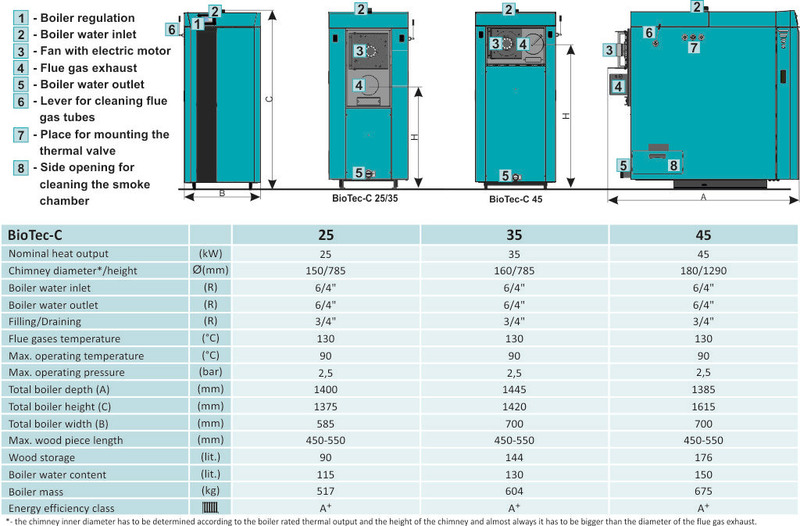 The boiler is tested and certified according to the European standard EN 303-5:2012 and meets class 5. It is manufactured in compliance with ISO 9001/2008 and ISO 14001/2004 standard and meet the requirements for ECO design (commission (EU) 2015/1189). 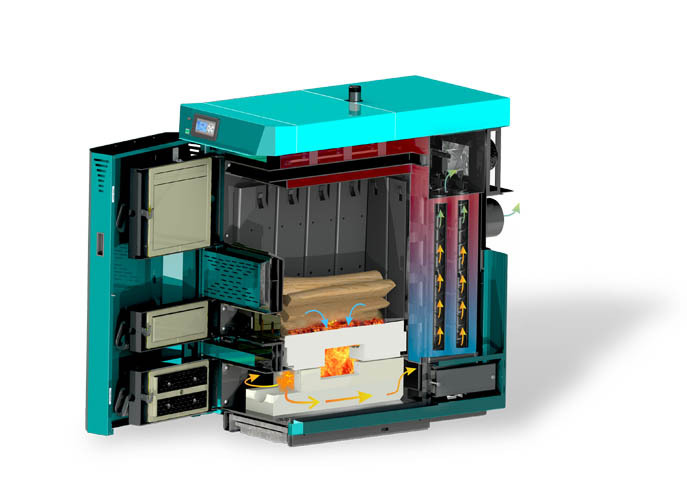 Pyrolytic combustion makes it possible to use more than 85%, which saves considerably compared to classic wood boilers. The built-in boiler control with the 4 buttons manages the boiler operation using the boiler temperature sensor and changing the rpms of underpressure fan on the flue gases outlet from the boiler. The duration of a single charge is at least 4 hours full power with the possibility of prolonging the entire day if the need for heating is reduced. Large firebox allows wood to burn up to half a meter long. Meet the requirements for ECO design (COMMISSION (EU) 2015/1189). Hot water boiler for central heating systems is engineered for wood log firing of the moisture content under 25% (min 1 year long air dried wood). The wood gasification principle enables total burning of the fuel, reducing the cleaning of the boiler to minimum (depends on wood quality and nominal boiler load). The design and construction, including the wood gasification principle of complete burning assures high efficiency and makes the boiler extremely economical. It is environmentally friendly because of extremely low concentration of harmful components in flue gases. Three doors and the combustion chamber enable loading with large logs as well as very simple cleaning and maintenance. 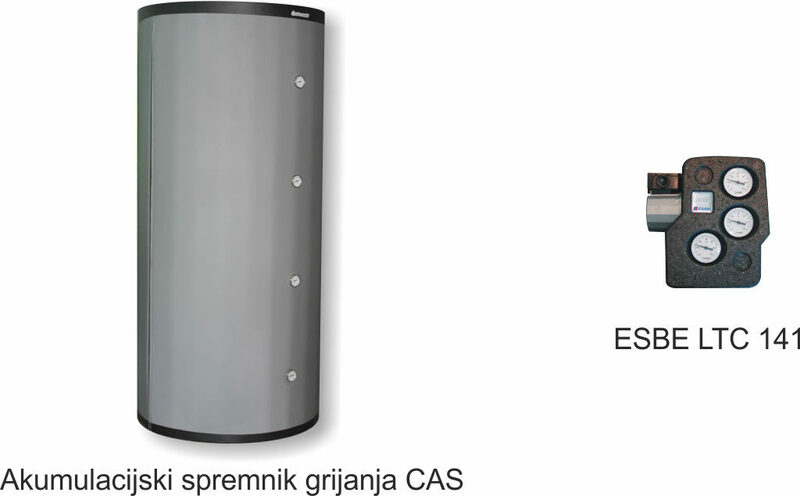 It is engineered for installation in open or closed central heating systems only through accumulation tanks (CAS), volume min. 50l/kW and a 3-way thermal valve at 60°C. It is delivered pre-wired with the built-in boiler control unit to control the boiler. In addition to the operation of the boiler, the boiler pump and the return flow (through the 3-way mixing valve and the return sensor), the control unit can manage the filling of the accumulation tank and heating of the domestic hot water tank (DHW sensor) (sensor + pump). Easy transportation and leveling by 4 adjustable legs of the boiler. The boiler is tested and certified according to EN 303-5: 2012 and meets Class 5. It is manufactured in accordance with ISO 9001 and ISO 14001 standard. Tvrtka Centrometal d.o.o. ne preuzima odgovornost za moguće netočnosti u ovom članku nastale prepisivanjem ili kopiranjem, sve su slike i sheme načelne te je potrebno svaku prilagoditi stvarnom stanju na terenu, u svakom slučaju tvrtka si pridržava pravo unositi vlastitim proizvodima one izmjene koje smatra potrebnim.